Although 3D printing technology is advancing rapidly and home 3D printing is becoming both increasingly accessible and reliable, it will likely be a while before metal printing catches up with plastic Fused Filament Fabrication technology. That said, there is a way to fabricate metal parts from some sets of 3D FFF designs. In this blog post, I will describe a technique I have been using with some success to produce high quality metal parts from 3D prints. Metal clay is essentially a very low-tech approach to powder metallurgy. Metal clays are a combination of atomized metal powder and organic, water soluble binders. When soft, metal clay can be worked like a regular ceramic clay, dried to a hard yet brittle state and finally sintered in a conventional kiln to produce a solid metal piece. The first metal clays were silver compounds but today metals such as bronze, brass, copper and steel are also readily available. Putting 3D printing with HIPS, metal clay, limonene as a solvent and finally kiln sintering together, we come up with the ‘Lost HIPS’ technique for creating metal parts from 3D prints. The beauty and power of CAD/CAM is the ability to define, manipulate, visualize and refine 3D parts numerically prior to actually creating the physical part. 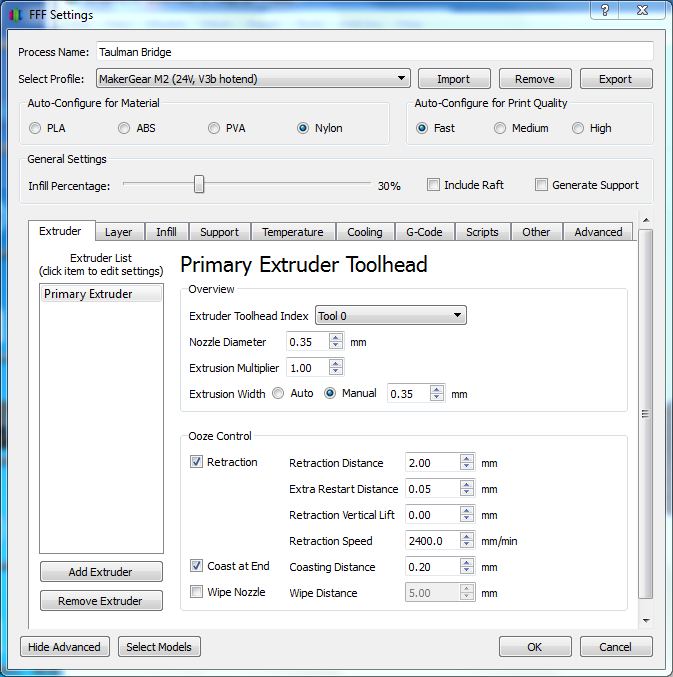 For our purposes, it is straightforward to take a 3D object definition in an STL file and create a mold for that part by performing a boolean difference operation between the 3D part and a rectangular cubiod (i.e. block). For this post, I used the ‘Sun Medallion’ design I found on Thingiverse. I then used OpenScad to create the cuboid and perform the binary difference to create a mold of the medallion. I tweaked the mold along the way to strengthen the connections of the arms to the central solar disk but the design is still quite obviously that of Hank Dietz. When printing a mold, try to find a good middle ground between a mold that is physically strong enough to work with but contains a minimum of HIPS material. In ‘Lost HIPS’, all the mold material has to be dissolved by the limonene – so less is definitely more. Sun Medallion mold printed in HIPS on a MakerGear M2 Printer. HIPS is soluable in acetone as well, which means it can also be vapor polished in the same way as ABS. I find vapor polishing to be helpful in smoothing the surface of the mold and sealing up any small holes or creases that may be left in the mold after printing – particularly when printing with thin layers. At present, I am using FastFire Bronze Clay as it is relatively cheap (~$200/kg) and easy to work with though I have found it very sensitive to sintering temperatures. 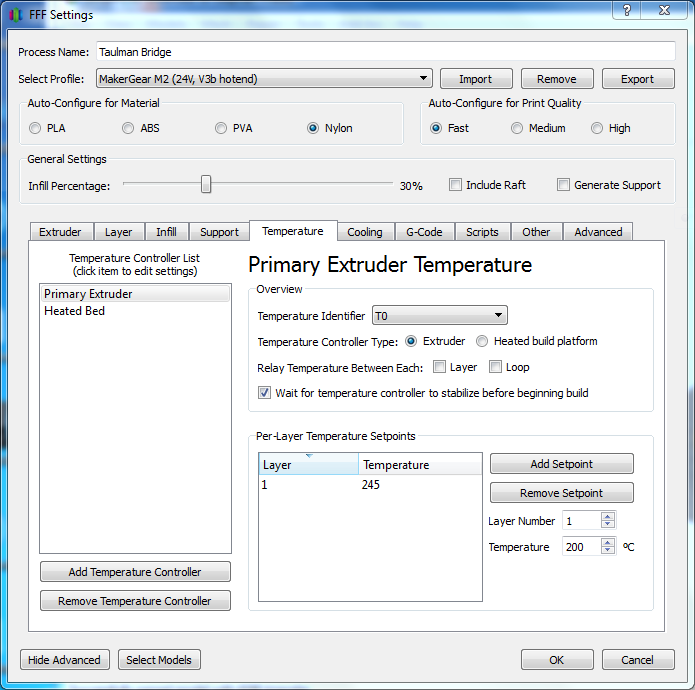 I have also worked with PMC+ and it is easier to work with and very forgiving with respect to sintering temperatures but it is expensive (~$1500/kg). When filling the mold, I have had the best luck painting the mold with water containing just a tiny amount of dish soap. The water will cause the clay to form a thinner slurry next to the mold (much like ‘slip‘) and the detergent acts as a surfactant to help insure the slurry covers the entire base of the mold. NB – do not use much water/detergent solution in the mold, as making the clay runny has lead to poor results for me. I just paint the surface of the mold with a brush and that is it. I usually put down a first layer of clay with an emphasis on insuring all the corners, nooks and crannies are filled and then fill the rest of the mold. I use an old credit card to scrape off excess clay. Once the mold is filled, I let it stand for a day to dry and sand the whole thing with a 200 grit sanding sponge to remove any excess clay. It doesn’t take much sanding to get to a point where the finer features of the mold are visible again. Finally, I wanted to make the sun medallion into necklaces for my daughters, so I added a loop to the back of the piece. To make the loop, I used three pieces of HIPS together and placed a bit more clay over the HIPS and onto the back of the medallion. Sun Medallion mold after drying, sanding to remove excess clay and the addition of the necklace loop. Once the clay is dry, place the mold into a container of limonene and let the solvent do its work. I use a glass container with a flourinated plastic lid that I found at Bed, Bath and Beyond (don’t forget your coupons). Limonene is a solvent and will attack non flourinated plastics, though plastic gas cans and many consumer plastics are flourinated these days. The more HIPS in the mold, the longer it will take to remove the material so expect anywhere from overnight to a couple days to get all the HIPS removed. Fortunately, the metal clay does not appear to be nearly as sensitive to limonene as does the HIPS, so a couple days in a limonene bath does not appear to effect the clay. Once the bulk of the HIPS is gone, I soak the piece in fresh limonene for a couple hours to get rid of the rest of the mold material and then dunk it in acetone for a minute or two. The acetone serves two purposes. First, it removes any gooey HIPS /limonene emulsion from the surface of the piece and second, it is a drying agent so after just a few minutes in air the piece is dry and can be worked a bit before sintering. The bronze metal clay Sun Medallion after HIPS removal. Note a bit of stringy HIPS material on the mesh holder and some HIPS left around the crease between the central disk and the sun arms. This extra HIPS on the piece will burn off in the kiln. In its current state, the dried clay can be worked just as green clay can be worked. I will typically sand off visible printing artifacts (i.e steps between layers), fill any voids with fresh clay and file off any excess material from the piece. At this point as it is much easier to add/remove the clay material compared to post sintering. I also find it helpful to use the water/detergent solution again to paint the surface a couple times to get a smoother finish. The metal clay will absolutely reproduce every detail in the printed mold, so it you want a smoother aesthetic look – now is the time to take off the rough edges. Once you are happy with the appearance of the piece, it is time to sinter. I have a Paragon Caldera kiln which I love. I did not get the digitally controlled version which I would suggest strongly for anyone looking to purchase a kiln. I find the difference between a beautiful finished piece and an under-fired or over-fired piece to be just tens of degrees F. Thus I end up having to watch my kiln closely as it finishes its ramp to insure it gets into the right temperature range and holds that range long enough to fully sinter the piece. Pretty much any material other than silver needs to be fired in an anoxic (i.e oxygen free) environment. For firing metal clays, someone far more clever than I figured out that one could easily create a locally oxygen free environment by burying the piece in carbon granules during firing. This process works spectacularly well. I will not go into the details here, there are plenty of references online. I use a ceramic container for firing. Firing in a stainless steel vessel leaves lots of black oxide in my kiln whereas the ceramic fiber pot leaves no residue whatsoever. Having sintered with both, I also expect the pot to outlast a stainless vessel as well. I typically rest the piece on a piece of fiber kiln paper and then put the piece on the paper into the container filled with an inch or two of acid washed carbon granules. I do not cover the piece but ramp my kiln to 400F and leave it there for an hour to burn off any remaining HIPS and the binder in the metal clay. The cleaned up Sun Medallion on a piece of kiln paper. The bronze clay Sun Medallion and kiln paper on a bed of carbon in the firing vessel. After burning off any organic compounds left on the piece, I put another piece of kiln paper over the top of the piece and fill the container with carbon granules to within an inch of the top. I put the lid on the container and ramp my kiln to 1450F and leave it there for an hour. I then turn the kiln off and crack the lid to cool the piece quickly. It can take several hours for everything to cool to a point where it can be touched. In particular, the vessel and carbon will hold heat well. Once everything has cooled, I remove the piece from the carbon granules and clean it. I use a Dremel tool with a wire brush to take the black scale off the surface of the piece and then use a bath of Picklean to remove the rest of the oxidation. It may take a couple Picklean baths to really get the piece cleaned up but it is the only way I have found to get all the little details in the piece bright and shiny. I have created a number of other designs as well, below is a Tudor Rose extracted from a Thingiverse design. What is interesting about this design is that there are regions in which upper layers overlap lower layers and if your printer does a decent job of bridging and you can force the metal clay into the mold, you can get a fairly intricate design which would be hard to fabricate using other means – like straight up stamping. A Tudor Rose in Silver and Bronze. In this example, the bronze piece has been slightly overfired and lost some of the detail of the original. In contrast, the silver has retained much of the original detail to the point where the individual printing layers are clearly visible. Though there are a number of steps involved with this process, for folks with more engineering talent than artistic talent this provides a way to create some gorgeous pieces simply by ‘turning the crank’. After a few practice runs, I have found the ‘Lost HIPS’ process to be fairly straightforward. Next I will probably try to fabricate some structural pieces using steel clay. I have tinkered with steel clay once early on and I expect to have similar success with that material as well. This entry was posted in 3D Printing, Computational Geometry, HIPS, Lost HIPS, Makergear, Metal, Metal Clay on November 16, 2015 by Stephan Friedl. The CGAL library for computational geometry is truly a work of art. It focuses on precision and accuracy above all else and yet manages to stay very flexible through perhaps the most comprehensive use of C++ metaprogramming that I have ever encountered. CGAL deals efficiently and elegantly with rounding errors in IEEE floating point operations by escalating from IEEE floating point to exact numeric computation when rounding errors may occur. The library is the product of 15+ years of development by some of the best computational geometry developers on the planet. CGAL is not the most accessible library to just pick up and use. The template based generic programming paradigm can be difficult to wrap your head around at first but there are just enough examples to jump-start HelloWorld style apps. Beyond that, the data structures are optimized for computational geometry not for obviousness. Traversing the data structures requires a bit of study and thought to accomplish a task. One of the more powerful aspects of the CGAL library is the Delaunay 3D Mesh Generator. This generator can take a variety of geometric elements, such as polyhedrons, and generate a 3D triangulated mesh. This operation is key to 3D printing as it is that triangulated mesh which is then sliced to create the layer-by-layer extrusion paths. The OpenSCAD 3D CAD Modeller (http://www.openscad.org/) uses CGAL for binary polyhedral operations and mesh generation. There are not a lot of persistence formats supported in the CGAL library itself. For 3D printing, the primary file format is arguably the STL (Standard Tessellation Language) format. An STL file contains a list of triangular faces defined by 3 vertices and a normal to the facet. Though the STL format is straightforward, it took a bit of poking around and experimentation to figure out how to traverse the mesh and order the vertices to insure that the mesh is manifold. Getting the various template arguments right was also an occasional issue. The code below takes a CGAL Mesh_complex_3_in_triangulation_3 instance, a list of subdomains within the mesh complex and an open stream. The template function writes the listed subdomains to the stream. Each subdomain is written as a distinct solid in the STL file. It compiles under VS2010 and newer g++ releases. // ease the task of iterating over the points associated with vertices in the mesh. // a straightforward modification of this code. The code above includes a pair of helper template classes to ease iterating over mesh points for determining the bounding box for the mesh. The STL format requires that all points be positive but it doesn’t care about units. The following code snippet demonstrates how to call the template function. The template parameter is inferred from the function arguments. In later posts, I will follow up with CGAL examples of using Nef Polyhedra and performing the kinds of binary operations needed for CSG (Constructive Solid Geometry) applications. Having the facility to mesh the polyhedra and persist the mesh in a file format that can then be consumed by a slicer and printed is a valuable stepping stone. This entry was posted in 3D Printing, CGAL, Computational Geometry, STL File Format on December 27, 2014 by Stephan Friedl. I tend to follow a model of disposo-images for new development projects. I create an image in ESXi for a project, put just the tools I want into the image, use it only for a month or two and then blow it away when I have either finished the project or simply want to return to a clean environment. In the past I have used Ubuntu but most recently I have been using a lighter Lubuntu install and using X2Go for remoting the desktop. The process below works for the 14.04 LTS release of Ubuntu. 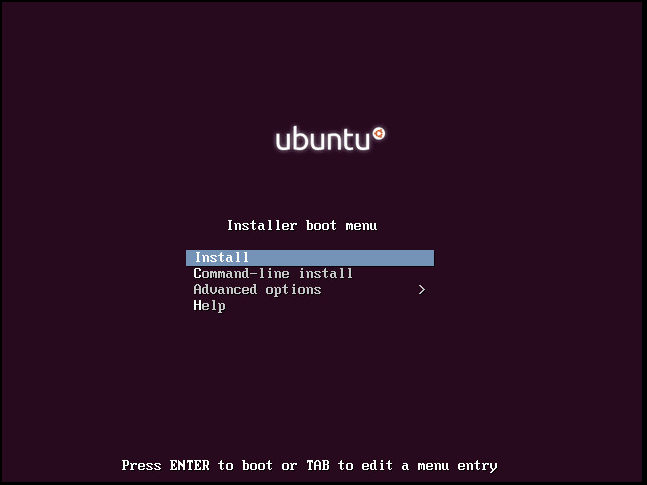 First screen of the Ubuntu mini-iso installer. Choose the ‘Install’ option and follow the dialogs. I typically just choose to use the entire disk when prompted for storage options. I also typically leave automatic updating off and handle that manually if I feel it makes sense to update. Eventually, it will get to the Tasksel dialog. 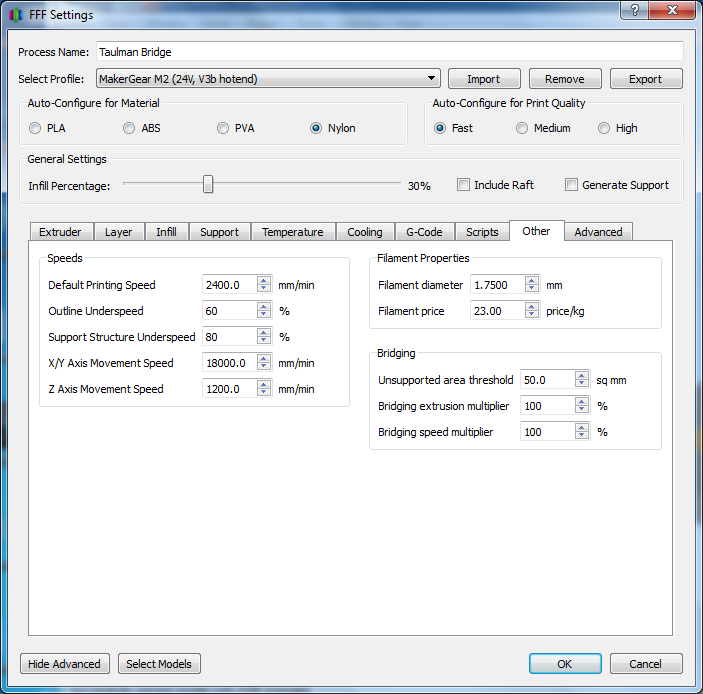 Tasksel dialog. Choose the OpenSSH server and the Lubuntu Desktop options. On this dialog I usually just choose OpenSSH and the Lubuntu Desktop. The Lubuntu desktop doesn’t have nearly the bloat of the Ubuntu desktop so while it is not truly the ‘minimal installation’, it is very light none-the-less and you would have to install the majority of the pre-installed apps anyway. If you are using ESXi you can install VMWare Tools at this point but you do not have to install them as most of the virtual drivers are already in the Ubuntu distribution and we will not be needing the nice X integration into the VSphere client. I typically map the desktop display to an entire monitor. Sometimes on the first connection after a reboot, the desktop does not resize to fill the screen but I’ve found that suspending the session and then restarting it forces the display to resize. Maybe there is a more elegant fix out there but the suspend/reconnect works anyway. After you have downloaded the Eclipse CDT zip file and extracted everything, it is usually nice to create a desktop shortcut. You can do this in Lubuntu using the lxshortcut tool. Open a terminal window and move to your ~/Desktop directory, then do the following. That will pop a small dialog, just click ‘OK’. You should see a shortcut labelled ‘eclipse’ on your desktop. Right-click on the icon and select ‘Shortcut Editor’ from the drop-down menu. A dialog for the shortcut editor will open and will allow you to choose the executable for the shortcut (i.e. eclipse) and an icon file (i.e. icon.xpm from the eclipse install directory). The minimal install of Lubuntu does not include the GCC C/C++ compilers. Adding them is also very straightforward. At this point, you should have an image with compilers, JDK and Eclipse CDT installed and configured. I usually snapshot the image at this point so I can branch new, clean images for other projects without having to go through the install process again. This entry was posted in Lubuntu and tagged Development VM, Eclipse, GCC, Lubuntu, X2Go on September 28, 2014 by Stephan Friedl. I have been dabbling in 3D printing for the last six months with my MakerGear M2 printer (http://www.makergear.com a fantastic precision machine tool) and have done a lot of printing in PLA. PLA is great for a lot of objects, particularly the various elephants and other things I print for my kids but is too brittle for some types of applications. I have a couple projects I am contemplating that require a tougher material, so I gave Taulman Bridge Nylon a try. Like all things in 3D printing, there is a learning curve but once you have a process for printing with this nylon, it is a fantastic material. The ‘Bridge’ nylon is intended to combine the toughness of nylon with the printing ease of PLA. I have not tried printing with regular nylon so I cannot comment on how much easier it is to print with Bridge, but printing with Bridge is not quite like printing with PLA. Bridge still absorbs water, it requires a higher print temperature and at least for me, I need to print with thicker layers at a slower speed with Bridge than with PLA. That said, with the right adjustments in place my success printing with Bridge is pretty darn close to my success rate with PLA – probably 90%+ prints I start complete acceptably. Bridge comes on a small diameter spool sealed in a bag with silica gel drying packets inside the bag. Despite the Bridge formulation to reduce wetness, the packaging and the relative dryness of Colorado, I had little success printing with Bridge right out of the bag. Right out of the bag, you will see a lot of steam coming out of the nozzle and I got intermittent sputtering as well. I tried baking the spool in the oven for 6 hours at 175F and this seemed to work reasonably well though the spool deformed a bit. Also, I got the sense that the inner layers of the spool may not have dried as well as the outer layers. Preparing to dry a length of Taulman Bridge nylon in a small toaster oven in my garage. I typically pull enough material from the main spool for a specific print, clip it and then bake it loose in the oven at 175F for 6 to 8 hours. After baking, I let the material cool in the oven for a bit and then I transfer it immediately into a zip-lock bag with a couple packs of silica gel for further cooling and drying overnight. I use the Simplify3D (http://www.simplify3d.com) software package to slice my models and control the M2. I’ve used a number of the more popular open source packages as well but I really like all the key functions in one place with an easy to navigate GUI. I took the suggested settings for the M2 and nylon and through trial and error made some adjustments from that starting point. The primary problem I ran into was ‘popcorn’ from the print instead of a smooth stream of nylon. After that I also had some adhesion and warping issues. The four main changes I made were to bump up the extruder temperature to 245C, start the build plate at 70C then ramp to 90C for the second layer on, cut the printing speed in half and finally stick to a 0.3mm layer height. 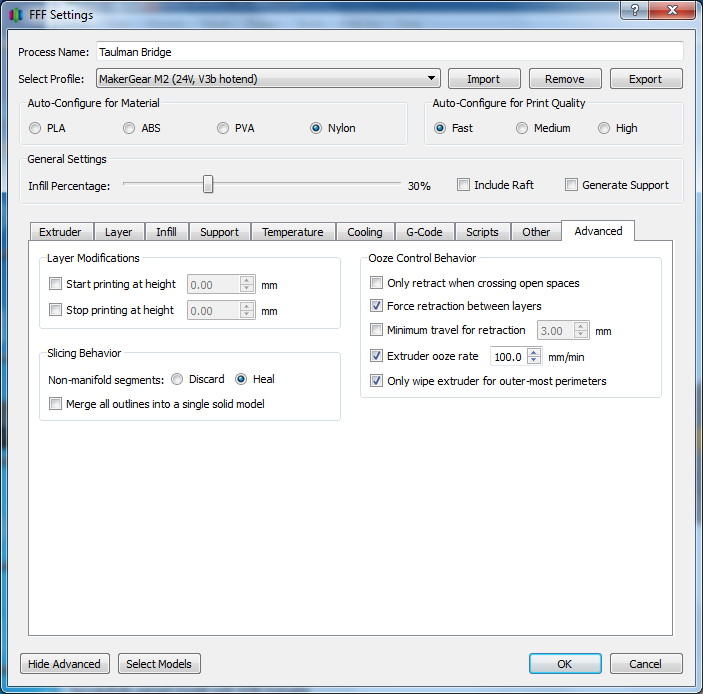 Extruder settings for printing with Taulman Bridge on my MakerGear M2. Note the Ooze Control settings. Heated bed at 70C for the first layer and then 90C for the rest. Retraction control and ooze rate. 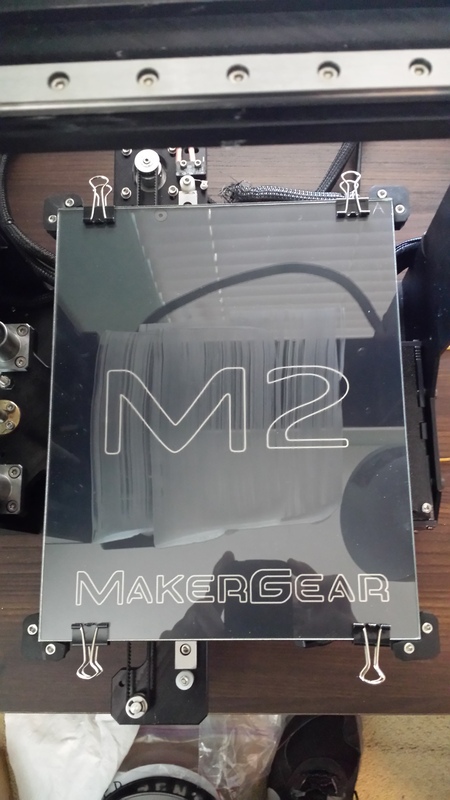 A couple test prints with clean glass had adhesion and/or warping problems. I gave the Elmer’s glue coating I use for PLA a shot and it worked extraordinarily well. So well in fact that I have to use a very thin layer of glue, as with thicker layers the nylon is very, very hard to detach. Below are a couple picture of the wet glue on the plate and what it looked like dry just before printing. Build plate with a thin coating of Elmer’s white glue to improve nylon adhesion. Plate with the dried glue at 70C. For an example of what is possible with Bridge on the M2, I printed Emmett’s Gear Bearing from Thingiverse (http://www.thingiverse.com/thing:53451). This is an absolutely ingenious design of a bearing that can only be produced with 3D printing. If you wanted to use this in a real project, then nylon would be a far better material than PLA or ABS. If you look at the design, it is pretty clear that if your printer or material aren’t dialed in well your odds of getting a working bearing are slim. There are lots of opposing surfaces which could fuse and render the bearing a hockey puck. Emmett’s designs on Thingiverse are exceptional, if you have not looked them over then do yourself a favor and do so. If the piece will not come loose easily from the build plate, I usually put the plate in the freezer for 5 or 10 minutes after which the piece generally pops right off. Check the start of the video for that demo. Completed Gear Bearing by Emmett printed on a MakerGear M2 with Taulman Bridge nylon. My experience with the Bridge material has been great, once I got the process right. Dry material, higher temperature, slow printing, thick layers and glue for adhesion all seem to matter but the results as demonstrated by the pictures and video are pretty self-evident. 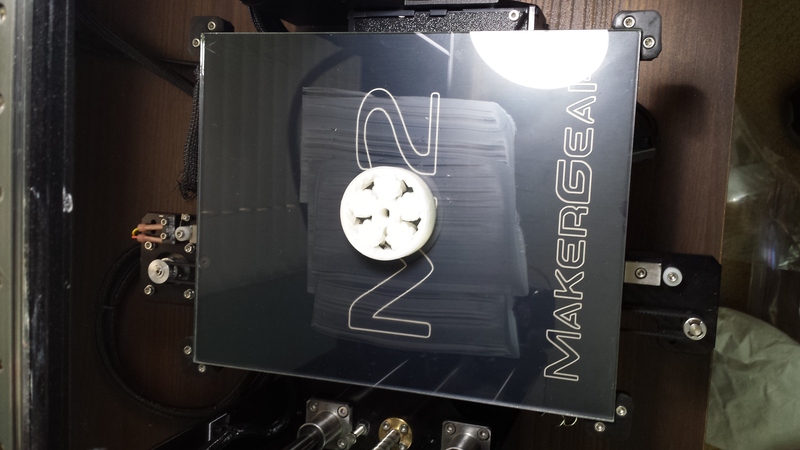 This entry was posted in 3D Printing, Makergear, Nylon, Simplify3D on September 7, 2014 by Stephan Friedl.